There are situations in which you can only be astonished by what you see in terms of interior design. This is exactly the case with a miniature house of 594 square feet that has a perfectly designed interior that takes advantage of literally every single corner available. The house you will see below is the work of Mizuishi Architects Atelier and is positioned close to a river, in a triangular space. The designers did a wonderful job as they used the space available in an impressive way, all while creating a really cozy modern cottage setting. 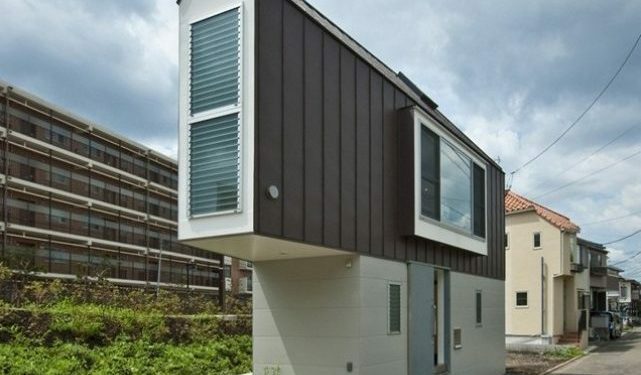 This tiny house is basically arranged in 2 main areas: downstairs and upstairs. You will find the main living area downstairs, with windows that maximize natural daylight use. Upstairs you will find the kitchen and the dining area, all arranged with a high ceiling that makes the space larger than it is. As expected, in order to maximize the space available, the home’s interior is minimalist. The walls are white and we are faced with a perfect approach to small space decoration. Watch the pictures and be amazed.